The Telstra VVX 1500 Business Media Phone has high-definition voice capabilities, a 7in touch screen, Gigabit Ethernet and an integrated camera. The 300-plus organisations currently using Telstra’s IP telephony product (TIPT) and Next IP network can use the video telephony service by upgrading their existing desktop phones. 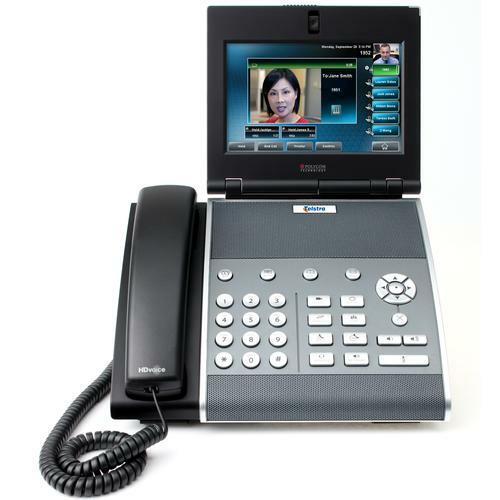 Telstra has partnered with Polycom to release the Telstra VVX 1500 Business Media Phone, which has high-definition voice capabilities, a 7in touch screen, Gigabit Ethernet and an integrated camera. The phone is available to Telstra business customers from this week on a rental plan of $45 per month over three years. Telstra's acting Executive Director, Data, IP and Enterprise Services, Carol White, said that the video telephony service would benefit businesses in all industries. "Video telephony represents a new opportunity for businesses looking to increase their face-to-face contact with customers, staff and suppliers. It can facilitate faster decision-making, improve productivity and can also provide genuine alternatives to some business trips — helping to reduce a business' carbon footprint and travel expenses,” she said. Telstra has also launched high-definition voice calling between businesses that use the Telstra IP network. "Organisations currently using HD-capable TIPT handsets will automatically access HD voice calling when connecting with other TIPT customers with compatible handsets. We expect new customers will move quickly to equip their meeting rooms with this technology,” said White. A Telstra spokesperson said the company thinks consumer adoption of video telephony is about 2 to 5 years off. It will depend on technology standards being agreed upon and a reduction in device costs.